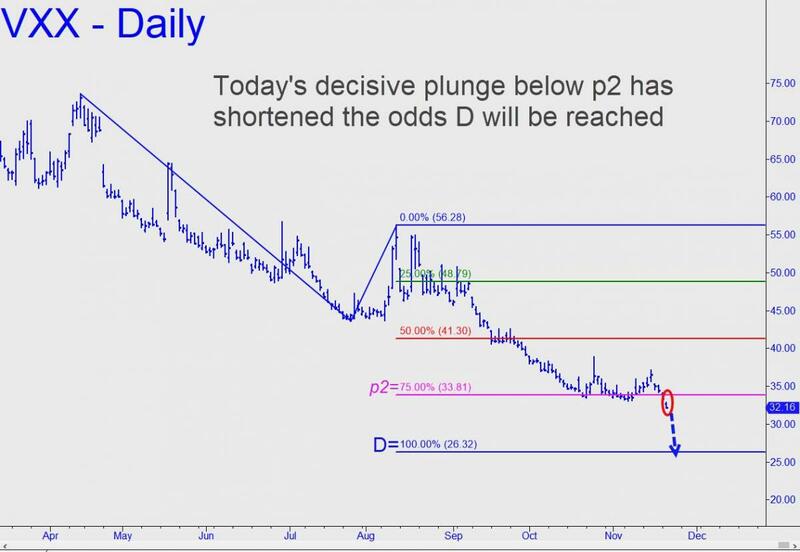 Hard as it is to believe, VXX took a crucial step Tuesday toward a longstanding target at 26.32 that until recently had seemed as remote and inaccessible as a seashell lying at the bottom of the Marianas Trench. The relentless downtrend has been driven by an equally relentless bull market in stocks. The fact that the broad averages have not corrected significantly in years has sucked the marrow from VXX, causing the volatility trading-vehicle to implode over months and years, like a collapsing dwarf star. Based on today’s plunge beneath the pink line, a ‘secondary Hidden Pivot support,’ odds that the 26.32 target will be achieved are now no worse than an even-money bet. If so, it would imply that the S&Ps, and presumably other stock indexes, are bound much higher over the next 6-10 weeks. Since we only trade this vehicle from the long side, we’ll need to wait for it to achieve the target before we consider buying call options. For now, let it suffice to ponder the awesomeness of a bull market that has stretched certain technical indicators and cyclical benchmarks into another galaxy.